I have a real fondness for Ghost Dogs of Moon Lake, which figures in as number seven in the acclaimed Nancy Drew game series. I thought that everything came together so well in that game and wondered if it could get any better. Well, it could and it did. After playing Danger On Deception Island, I think it is a tough contender for that coveted top spot and may well be the best one yet. With the gauntlet thrown, let's see how they did. A vacation from all those pesky mysteries – yeah right! Deception Island begins with Nancy talking about her scheduled trip to an isolated area off the Washington state coast. For once, Nancy has plans for nothing more than a relaxing vacation on a wayward Island and hopefully some whale watching. However, she expresses some initial unease about this vacation. Of course, trouble never seems too far away from our fair-haired detective and Deception Island proves aptly named. So is it because her gal pals organized this trip, the constant fog, her inability to embrace the concept of relaxation or is it just that she is a danger magnet? Hard to say. But before you can say Carson Drew, Nancy is once again in the thick of it. Bare seconds after arriving on the Island, Nancy learns that her hosts’ boat has been badly vandalized and torn apart. 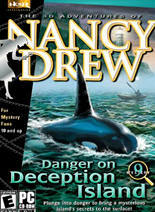 Nancy also learns that a local controversy over a “displaced Orca” may have prompted this violent attack. The fishermen and many locals want it towed out to a pod, out of the way of the fishing fleet. The federal agency wants it monitored to make sure it is healthy and to have time to investigate and figure out what pod the friendly killer whale belongs. Katie Firestone, our host and local whale watching tour guide, fears it could be sick and might need treatment. And of course there’s more. There have been a series of mysterious town burglaries, an ancient mystery of lost ships, stolen booty, shanghaied sailors, a mysterious reclusive resident and other odd events. There is even a mysterious sea creature, first mentioned in ancient tribal lore. It is reputed to be the source of unexplained disappearances and lost ships. Perhaps Nancy can find out whether Caddy, as the locals call it affectionately, is a mere tall tale or the real deal. What about Nancy’s ever-elusive vacation time? Well no time to waste, clues and suspects abound. Yep, once again, we find ourselves on the trail with Nancy Drew. Past Nancy Drew games have had their fair share of interesting suspects and side characters. I had to stroll through memory lane to be sure, but Deception Island seemed to have more characters than prior games. First you have the entire Nancy Drew crew available through e-mail and/or phone. George, Bess, Frank and Joe Hardy all play their part. As in past games, you can contact them for in-game hints or just a “how am I doing” gut check. Hannah, the long time Drew housekeeper, keeps our laptop mailbox busy with news from home. Then there are the main characters and key suspects. Katie Firestone, our host, owns a whale watching business and is the out spoken protector of the Orca. Questions are raised about her motives and even she is not free from suspicion. Andy Jason, her competitor and owner of Whale World, has been actively trying to buy her out. Could he have gotten tired of her refusals? What is his role in all this? Then there is Holt Scotto, a salty fisherman and newly declared candidate for Harbormaster. A Fisherman by trade, he resents the wide berth mandated by the federal agency for the Orca. Ships must give the Killer Whale plenty of distance in their travels out of the Bay – which means added travel time and costs. How far would his resentment push him? We have the affable owner of the town restaurant, Jenna Deblin. She not only inherited the restaurant, built in 1866, but its role in a fascinating history linked to the towns past. Were there smugglers and those who would shanghai unsuspecting men and what role did her ancestors play in these uncertain times? Could she be hiding something behind her agreeable façade and endless bowls of clam chowder? There is a mysterious recluse who communicates only through odd messages in bottles that find their way onto shore. What are her secrets and why did she leave the main island for her refuge on nearby Scraeb Island, so long ago? There are also several experts Nancy deals with through her laptop and cell phone. What is new to this game and wonderfully done, are the added animal interactions in the game. The lost Orca of course takes center stage, but there are crabs and other marine life as well. I highly recommend that this added level of immersion and interactive fun is repeated in future games. The subtle improvements in character animation that surfaced in Haunted Carousel are notable in Deception. The voice talent, never a weak spot in any of the games, satisfies here as well. I don’t want to give away much more about the characters and their roles in the game, as it would be a shame to ruin the many surprises in store for the gamer. Best to just say that the characters are once again solidly integrated into the game, both graphically and plot wise. Puzzles, Paradoxes and game fun. As soon as you start the game, you will encounter several puzzles, clues and hints of what lies ahead. None were brain breaking, but they weren’t simplistic either. This game has so many varied puzzles, that it is difficult to catalog them all. In fact, I cannot think of another series title that had such a great blend of challenges. There are hands on practical challenges, like get into a locked door or reconstruct a broken water pipe. The game environments lend themselves to this eclectic mix, as you will find yourself above ground, in buildings, underground and on the water. As in Scarlet Hand, there is an educational component to the game, where attention to research, in game history and facts will fare you well. At one point, you will need to listen to information about Orcas to succeed with a series of related puzzles to get an important item needed to advance in the game. Other historical items should be read or noted, as they provide valuable clues and added plot depth. There is also an arcade type puzzle in the game. But, unlike the Barnacle Blaster in Haunted Carousel, this one has an in-game auto cheat. Try your hand several times and if you can’t succeed, the game considers it won. I appreciated this accommodation for those gamers who would rather pass something like this up, even if it were on the easier side. There are also standard stand-alone mechanisms that will need to be solved in the game. I believe with so many types of puzzles programmed into Deception Island, that there is something for everyone in this game. One of the games unexpected charms, were some in-game diversions, built into the gameplay just for fun. No giveaways in this review, just get ready for some cute side trips in your puzzling interactions. Keep your eyes peeled sharp for other side items. The later games in the series started containing item references to past Nancy Drew games and had some Easter eggs as well. It is possible that I missed some references in those games, but it seemed to me, that Deception Island had more of these imbedded goodies. For those unfamiliar with the term “Easter Egg”, these are items that pop up or will reveal themselves when a player interacts with the game in certain ways. Typically, constant clicking in one place will cause one to pop up. In game references are not eggs per se, but are fun rewards for series fans. In addition to nods to Haunted Carousel, Scarlet Hand, Final Scene, and Royal Tower, I spotted one for Ghost Dogs, that I missed the first time around. SO be sure and push the limits of your interactions and click on anything that has a highlight and see how many you can spot. Some are accessed by clicking on an additional arrow in close up that may be at the top or side of your screen shot. There are at least two Easter eggs that I found so far, though there may be more. Praise goes out to Herinteractive for crafting all these fun tidbits for the adventurer who wants to do more than just beat the game. The music has a distinctly nautical feel and is well done. Of course you can’t mess with the Nancy Drew theme music at the menu opening and start up of the game. Always feels like old home week every time I install a new Nancy Drew game and wait for those familiar refrains to kick in. I did enjoy the sea chantey tune that cropped up in many game locales. It was a great song, with the traditional tabor, fife and fiddle and a rollicking beat. It can get a bit tiresome after a while, but there did seem to be variations of the key theme in different spots to mix it up a bit. The graphics are similar to Ghost Dogs, which I thought had the best graphics to date. Lots to examine visit and wander through in this game. Deception Island had the widest variety of in game environments to date. I really enjoyed this after the oddly static feel to Haunted Carousel. Here, Nancy will stroll along beaches, rocky shores and across ocean expanses. You will visit a wide variety of indoor locales as well. The map feature used well in Ghost Dogs is replicated here for Nancy’s many bike trips to and from locations on the island. It’s use as a shortcut made sense for these trips and was well integrated. Ambient sounds and other factors were very nicely done. Whether it was the sounds of revelry from an adjacent room, seagulls and waves on the shore, the creaking of the boat as it rolled in the tide and of course the mournful call of the foghorn. The atmosphere was never neglected. I particularly liked the little items you could examine or interact with that had little to do with advancing the game, but add a point of history or detail to the story line. Not much really to be said here. The game is point and click, utilizing a “smart” cursor that reacts to hot spots in the game. What deserves special mention is the diversity of conveyances you access in your gameplay. You will walk, bike and kayak through this game. There is even a boat trip that occurs just for fun. The addition of the kayak to this game provides one of the more exceptional interactive environments. First used heavily in Haunted Carousel, there are also many moments where you better heed safety concerns. Disregard them at your peril! There will always be gentle debates between fans of this series as to the “best” Nancy Drew game yet. I will have to pick Deception Island, with Ghost Dogs of Moon Lake running a very close second. Deception Island to me has it all; a wide range of game environments, a host of credible characters, well crafted graphics and ambiance, and a great plot that weaves the curiosities of the past with the present day mysteries into one entertaining package. Then they threw in some diverting side events just for fun’s sake. Toss it all together and you have one charming game, sure to give adventure players their moneys worth and more.